The PostgreSQL substring function is used to extract a string containing a specific number of characters from a particular position of a given string. string The main string from where the character to be extracted. str_pos Optional. The position of the string from where the extracting will be starting. If this parameter is omitted, the substring function will start at position 1 (which is the first position in the string). ext_char Optional. 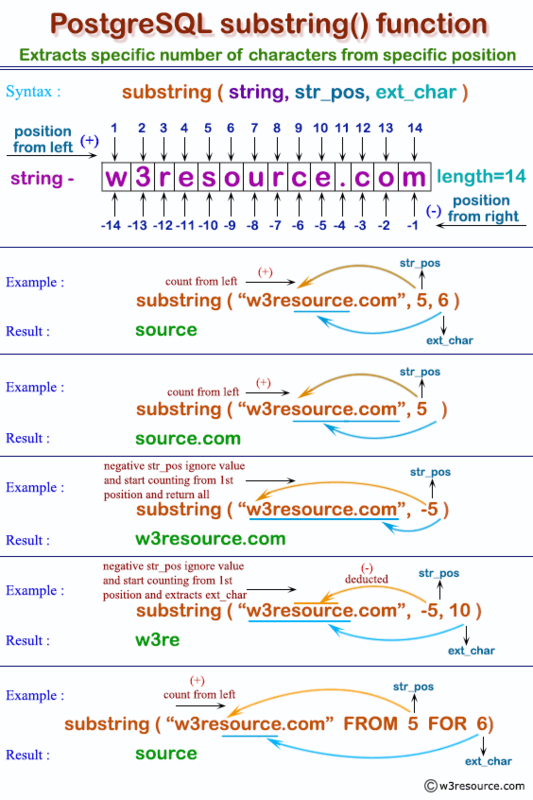 A number of characters to be extracted from the string. If this parameter is omitted, the substring function will return the entire string (from the start_position to the end of the string). The following PostgreSQL statement returns 5 characters starting from the 4th position from the string 'w3resource', that is ‘esour’. substring(first_name,1,4) "1st 4 characters of first_name"
position('an' in last_name) "Position of 'an'"